Digitalisation, automation and computerisation are taking the long-established building business by storm. Jump on the digital bandwagon and reap the benefits. Digitalisation is everywhere. A life without a smartphone? Unthinkable. The digital impact is huge. In fact, it is nothing short of a revolution, and it is taking the construction industry by storm, as well. Keeping up-to-date is key if you’re going to stay competitive. A study by the consultancy McKinsey & Company, commissioned by the Belgian Construction Federation, reveals that the construction industry suffers from a chronic productivity problem. Over the past two decades, work productivity in the construction industry has risen by just 1% per year. By comparison, the growth rate for the global economy was 2.8%. In other words, there’s ample room for improvement! Existing and new digital applications can make a valuable contribution in this regard. Digital tools geared to the various phases of the building process – from quotation to delivery of the building site – have but one purpose: making your life easier. Optimum business management and transparent communication with employees and partners, as well as customers, boost the efficiency of your company. 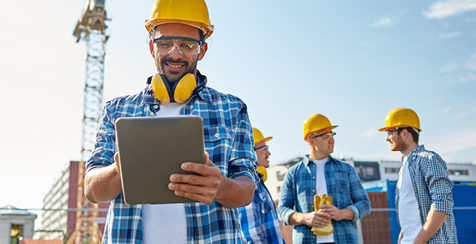 More than ever, new technologies cater to the needs of the construction industry. That is why it is a good idea to use digitalisation judiciously and reap the benefits. The fourth industrial revolution advocates a new organisation of a manufacturing or building process based on the efficient exchange of information, always and everywhere. At the building site, on the move or at the office: fast access to accurate information results in time savings and productivity growth. Standard elements such as vehicles or on-site equipment, human resources, administration and billing are digitalised. In addition, numerous technological aids are becoming commonplace such as Building Information Modeling (BIM), drones, virtual and augmented reality, 3D printing, intelligent glasses and much more. The advent of such instruments is transforming the industry at breakneck speed and, as a result, other actors in the construction process are also undergoing a digital makeover: architects and engineers, scientists, building material manufacturers, etc. If your aim is to keep communicating efficiently with these partners then you will need to invest in the digitalisation of your company. The digitalisation of your company obviously depends entirely on a reliable and stable data connection. You need this connection both at the office and at the various construction sites. Orange is the perfect partner to fulfil your needs in this regard. Click here and discover the advantages and applications the use of data in the construction industry has to offer.